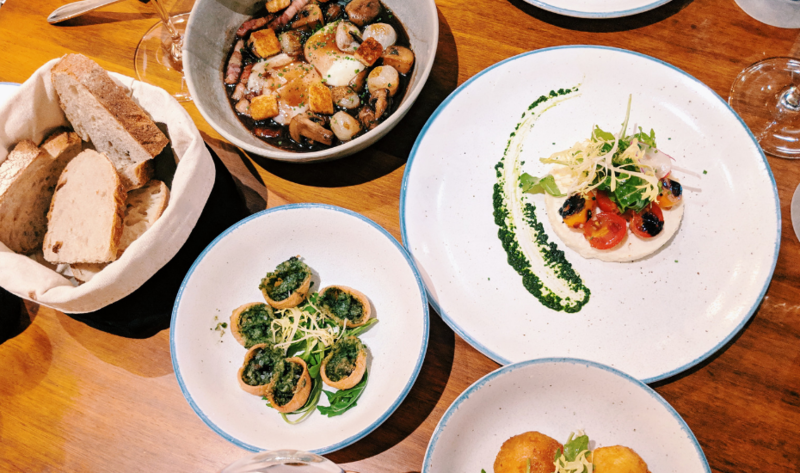 Our list of favourite Keong Saik eats ranges from healthy rice bowls at Afterglow to indulgent burgers at Potato Head Club. 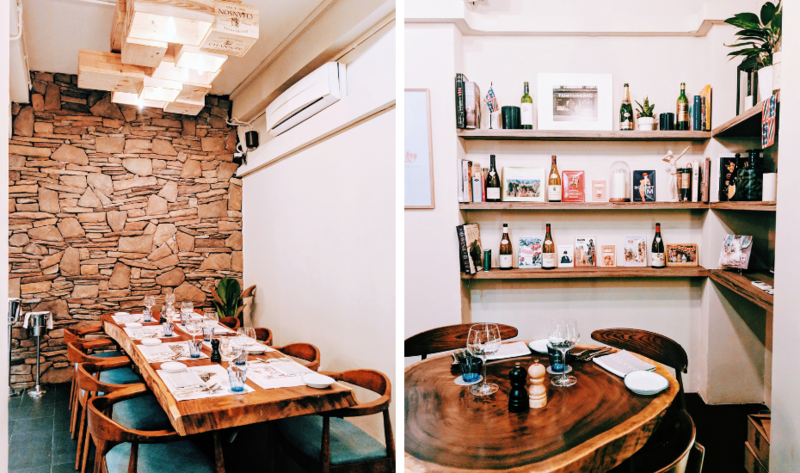 And now, we have a new discovery to add to our faves: say bonjour to Gaston Burgundy Bistro & Wine Bar, a Burgundian establishment that has us craving more regional French feasts. 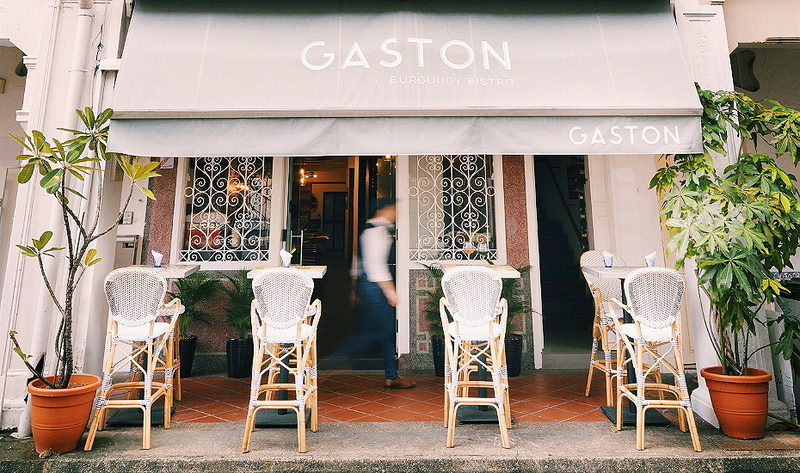 Burgundy native Geoffrey Daurelle is at the helm here, bringing his homemade specialities and jovial nature to this new kid on the Keong Saik block. 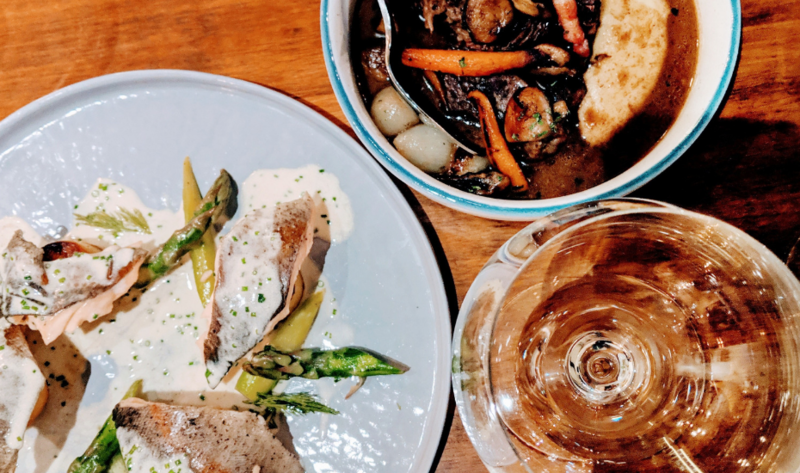 The curious thing about this Burgundian experience is how homely and comforting it feels – no matter that it’s the first time you’ve ever tasted the region’s cuisine. Seriously: the interior is so cosy that it almost feels like home. 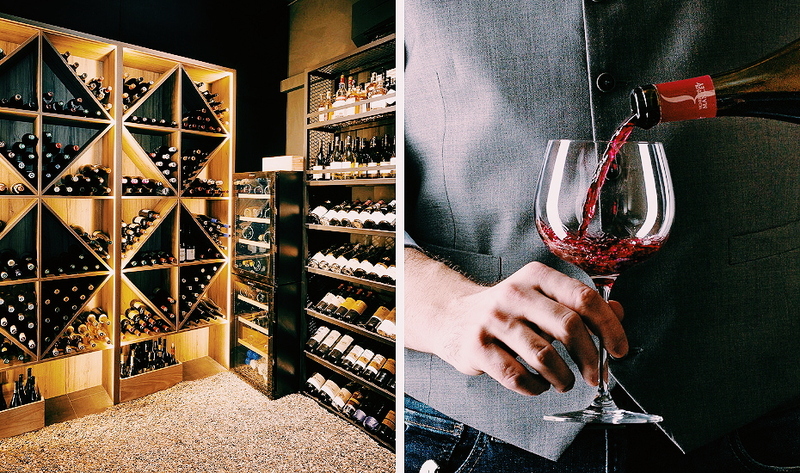 If home included a walk-in wine cellar. With spare wine crates to stick on the ceiling. And a balcony that looks like a French alfresco cafe… you get the gist. Geoffrey poured us a glass of bubbly before we began munching on a basket of sourdough. It might be tempting, but don’t fill up on the bread straight up ‘cos there’s more deliciousness to come. Plus, you’ll want a slice or two for mopping up the sauces and stews – starting with the red wine sauce from the oeufs en meurette (small: $13++/ large: $21++), a poached eggs starter with bacon and onions. For a vegetarian option, try the tarte à la tomate et chèvre frais ($12++): a goat cheese tart with tomatoes, pistou and salad. Geoffrey quips that it’s like the durian of French cuisine, but we’re into our goat cheese around here and doubt it’ll be as polarising as the king of fruits. Get one for the table, we say. 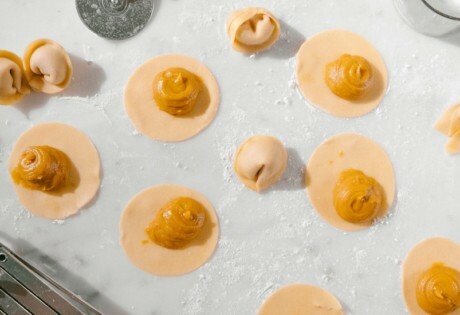 Ever been on a date and debated whether to skip the escargots or risk fussing around with tongs and shells? We’d usually vote in favour of satisfying your cravings, but if you ever wanted a fuss-free experience, the escargots de Bourgogne (6pcs: $15++/ 12pcs: $28++) is perfect in all its garlicky and buttery glory. Oh, and the shell is, in fact, a pastry that adds a lovely crunch – something we never thought we needed in our snail-eating experience, and we’re now converts. The croquettes Bourguignonnes (3pcs: $9++/ 6pcs: $18++) is another dish that we’d gladly inhale if it wasn’t a sharing platter. (Family-style eating is a Burgundian tradition!) It’s a simple yet addictive dish: ham and melty Epoisses cheese wrapped up in a ball of crispy batter. A plate of these wouldn’t last five seconds in our home. We shared our mains too. The truite à l’aligoté ($28++) is one that we instantly fell in love with, featuring a creamy white wine sauce (aligoté is one of Burgundy’s famous grape varieties) that we want to bottle up and take home. The trout fillet, asparagus and fondant potatoes were also cooked to perfection and oh-so-satisfying to slice into. We can’t imagine anyone not liking this, really. The heartwarming boeuf Bourguignon ($32++) is an ode to Madam Daurelle’s signature dish (yes, Geoffrey sought out his family recipe for this one). The beef fell apart easily and the mashed potato almost stole the show with an incredibly savoury creaminess. And here’s a tip to help you up your cooking game: one of Madam Daurelle’s cooking secrets is adding chocolate to the stew, which balances out the slight bitterness that comes from reducing red wine. Wine in the sauces wasn’t enough, of course. We paired our mains with wines in red and white. Specifically, the Trenel Juliénas Les Capitans 2015 to pair with the beef and the Domaine Louis Moreau Chablis 2016 for the fish. Speaking of wines, Geoffrey’s dedication to spotlighting value-for-money labels is reflected on the menu. This bar stocks quality wines at around the $60 mark, so there’s no need to fork out four-figure sums for a bottle (though his cellar has a few of those too – “for showing off”, he jokes). Not sure which to choose? The wine tasting flights are your answer. If you’re a fan of French vinos, you might find yourself popping by for a flight pretty often as the bar changes the theme every week. Some flights showcase wines from one specific vintner, others invite you to compare labels from different regions. 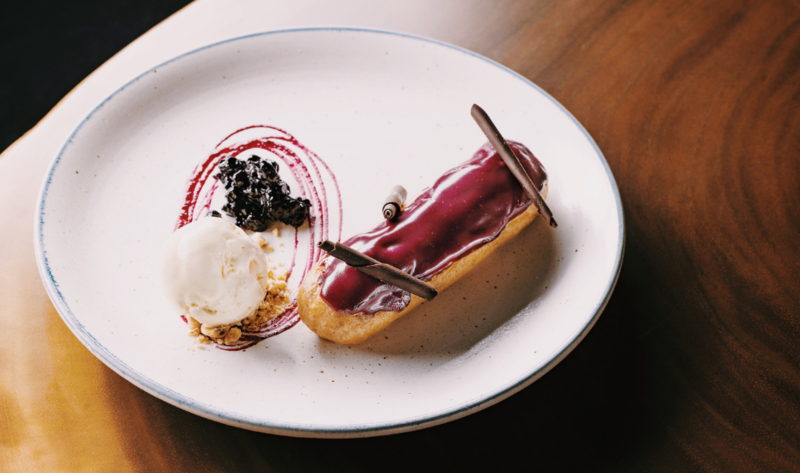 We couldn’t leave without taking a peek into the dessert menu and loved the restaurant’s twist on the eclair. This classic French pastry can be overwhelmingly saccharine for those who don’t have a sweet tooth, but not with the éclair au cassis ($14++). Expect a purple cassis filling instead of the usual chocolate or vanilla, served with a side of ice cream. We love how the slight acidity of the berry (an iconic Burgundian fruit) cuts through the sweetness of this dessert, making for a light yet satisfying way to end the meal. We’ll be honest: the dishes aren’t mind-blowing innovations, but that’s kind of the point. The unpretentious fare and cosy decor will draw you in and keep you there. This is the sort of place we’d be happy to hit up any day of the week, no special occasion required… Just don’t ask us how to pronounce the dishes with a convincing accent. Have you tried cocktails at Butcher Boy on Keong Saik yet?